Members receive a discount on events. Featuring a Selection of Paintings from the Brian P. Burns Collection of Irish Art. The Irish immigrants who fled their famine-ravaged homeland during the 1840s made an immediate and indelible impact on their adopted country. Within a generation, St. Patrick’s Cathedral rose above Fifth Avenue as a living monument to their ascendance in their newly-adopted home. Soon becoming an iconic New York City landmark and “America’s Parish Church,” the Cathedral is visited by millions and known throughout the world. Born in Ireland and educated in America, Archbishop John J. Hughes emerged as the visionary and driving force behind the Cathedral, which he considered a necessary sanctuary for his people and their faith. Focusing on his remarkable life, A Monumental Legacy tells the story of a diaspora for whom the Cathedral he envisioned represented both a spiritual home and a symbol of their success as a community. 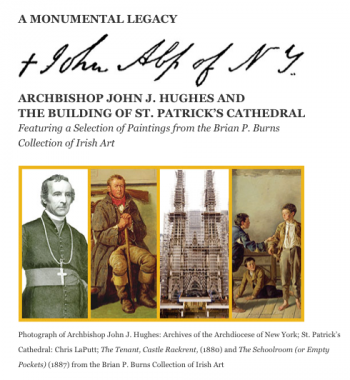 With St. Patrick’s Cathedral now undergoing a once in a generation restoration and with the passing of 150 years since Archbishop Hughes’ death, it is time to tell their story. Drawing on extensive original research and enhanced by a selection of paintings from one of the most important private collections in Irish America, this story is told by leading historians and cultural commentators. Further enhancing the exhibition, expert narrative panels and rarely seen artifacts from the Archdiocesan Archives will be on display. The American Irish Historical Society is a cultural institution featuring a library and archive, public arts programming, and events space.